This is the third solo album by Inoue Kikuko. The first pressing of this CD comes in cardboard package containing the CD plastic case and a color 48 page picture diary. 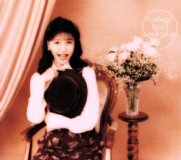 The cover picture has Kikuko wearing a brown flower design outfit over a white long sleeve blouse, and she's holding a brown hat. The back cover has Kikuko laughing and covering her mouth. The lyrics booklet is in color, and contains many pictures, all with Kikuko wearing the brown flower design outfit. The 48 page picture diary is made up of polaroid pictures taken when she was recording this CD. It has some of Kikuko's comments scribbled on the pictures. All songs (lyrics and music) on this CD are by Inoue Kikuko, and arranged by Kawai Kenji. This song is just music box music. A upbeat song where Kikuko sings about a mail box near her house. She considers it a friend that gave her courage to write a love letter. This song is the continuation of Wendenyan no Uta from Tadaima. It's got slow parts, fast parts, country-like parts.. (^_^;) It's a unique mix and it tells a story of Wendenyan, who sneaks out of the bag at night to go play outside. A slow song where Kikuko sings about the forest calling her to come. A fast song where Kikuko sings about her radio show. "Please don't sleep for 30 minutes. I want to deliver my talk to you via the starry night." A slow love song where Kikuko sings about the ajisai (hydrangea) flower in people's hearts. An upbeat, story song where Kikuko sings about a boy who hates ramen, but falls in love with a girl who loves ramen. In the story, the boy gradually becomes able to eat ramen. A slow song where Kikuko sings about her thoughts as she swims in the ocean. This is a funny song about the doushiyou kamen that appears around Kikuko whenever she can't decide between things. The first verse is about Kikuko trying to decide between pudding and cake. At the end she says, "pudding" in a very cute voice. The second verse is about Kikuko trying to decide between a pink and blue one piece. At the end she says, "this one" in a very cute voice. An upbeat, bouncy song where Kikuko tries to cheer you up, saying things will work out and to believe in yourself. A slow song, very nice vocals. A Hawaiian style song, where Kikuko sings about her family who are always feeling "Hawaiian". This song is family service. Kikuko's older sister and mother are in the background vocals. 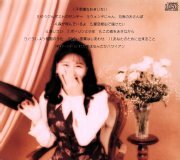 Kikuko talked a lot about this CD on her radio program Twilight Syndrome on the 1995.09.22 broadcast. There is no bad song. My current favorites are Hoshizora Keiyu de Todoketai and Anatano Tame ni Dekiru Koto.